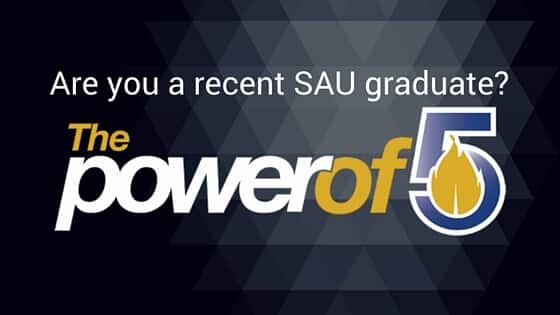 If you have questions concerning Foundation scholarships, please contact the SAU Foundation at 870-235-4078. William A. Anderson Scholarship: Funds provided by Mr. Anderson to benefit students from Arkansas or Texas who show leadership skills in addition to academic ability. J. David Ashby Finance Scholarship: Funds provided by Mustard Seed Wealth Management in honor of J. David Ashby to provide a scholarship for a Junior or Senior Finance student. Charlotte Baine Scholarship: Funds provided by James and Charlotte Baine to assist a deserving and needy student getting a degree in counseling. Whitley Reeves Barnard Finish Strong Scholarship: Funds provided by family and friends of Whitley Reeves Barnard to benefit a College of Business student majoring in Marketing. Dr. Lionel Barton Scholarship: Funds provided by Dr. Lionel Barton to benefit an agriculture major interested in poultry. Travis and Lauretta Buchanan Scholarship: Funds provided by Travis and Lauretta Blevins Buchanan to provide a scholarship for a student in the College of Education. Troy Buck Family Scholarship: Funds provided by friends of Mr. Troy Buck to benefit a student majoring in agriculture. Emogene Winn Burns, Ray Burns, and John G. Winn Nursing Scholarship: Funds provided by Ray Burns for a student in nursing. Dr. Raymond and Sharon Cammack Scholarship: Funds provided by Mr. Calvin Wetzig, Dr. and Mrs. Cammack, alumni and friends to benefit a student. Melvin and Myrtle Chambers Scholarship: Funds provided by Mr. and Mrs. Rodney Chambers and Mr. and Mrs. Dale Prince in memory of their parents. Imogene M. and Richard P. Clark Memorial Scholarship: Funds provided by Richard P. Clark, II and Roland L. Clark in memory of their parents. William L. and Dorothy M. Craig Music Scholarship: Funds provided by the friends of William and Dorothy Craig to benefit a band student. Credit Card Memorial Rodeo Scholarship: Funds donated in memory of Shaun Smith’s horse Credit Card for a member of the rodeo team. David and Margaret Crouse Scholarship: Funds provided by Dr. and Mrs. David Crouse to benefit a student majoring in Music, Theatre, or History. Quintus Crews Scholarship: Funds provided by the estate of Quintus Crews to benefit a student with financial need. Elizabeth Davis English Education Scholarship: Funds provided by Dr. Leo Davis and Dr. Elizabeth Davis to benefit a student majoring in English Education. Thomas Eugene Dennis Agriculture Engineering Scholarship: Funds provided by Dr. and Mrs. Larry Embree to benefit a student interested in Agriculture Engineering. Rex and Betty Dodson Scholarship: Funds provided by Rex and Betty Dodson to benefit a student who does not qualify for an academic scholarship. Charles F. and Dorothy Hunt Duncan Scholarship: Funds provided by Mrs. Dorothy Hunt Duncan to benefit a student with financial need. Charles F. and Dorothy Hunt Duncan Scholarship: Funds provided by Alan and Marjorie Duncan in honor of his mother for a student in the College of Business. Charles F. and Dorothy Hunt Duncan Scholarship: Funds provided by Alan and Marjorie Duncan in honor of his mother for a student in the College of Education. Sharon L. Eichenberger Scholarship in Agriculture Science: Funds provided by the estate of Sharon L. Eichenberger to benefit a female Agriculture Science student. Sharon L. Eichenberger Scholarship in Engineering/Physics: Funds provided by the estate of Sharon L. Eichenberger to benefit a female Engineering/Physics student. Sharon L. Eichenberger Scholarship in Pre-Medical Studies: Funds provided by the estate of Sharon L. Eichenberger to benefit a female Pre-Medical student. Rudy Eichenberger Physics/Engineering Scholarship: Funds provided by Dr. Rudolph Eichenberger to benefit a student majoring in Engineering or Physics. Dr. Rudy Eichenberger Scholarship: Funds provided by Dr. Rudolph Eichenberger to benefit a student in the College of Science and Engineering. Donald J. Embree Scholarship: Funds provided by Dr. Larry Embree in memory of his brother. Paul Jack English Scholarship: Funds provided by Mrs. Olga English in memory of her late husband. Harold H. Fincher Business Scholarship: Funds provided by the family of Harold Herbert Fincher to benefit a student in the College of Business. Betty L. Fincher Scott Scholarship: Funds provided by Peoples Bank in memory of Mrs. Scott to benefit a student majoring in a pre-medical field. Curtis Ray Garrett Scholarship: Funds provided by the estate of Ray Garrett to benefit a student majoring in Special Education. Gary and Gaywyn Golden Family Scholarship: Funds provided by Gary and Gaywyn Golden to provide a scholarship for a sophomore or higher level student. Cinda Hallman Scholarship: Funds provided by the estate of Cinda Hallman to benefit female students majoring in the College of Science and Technology. Lerue and Inda Mae Harris Scholarship: Funds provided by the estate of Inda Mae Harris. Ron Harris Education Scholarship: Funds provided by family and friends of Ron Harris to benefit a student majoring in education. Richard E. and Celeste Muse Harton Theatre Scholarship: Funds provided by the estate of Margaret Harton to benefit a student majoring in speech or drama. Quelle, Lovie, Opal Hayes Scholarship: Funds provided by Sarah R. Farrar Dodson in honor of her mother Quelle Hayes Farrar and her mother’s two sisters Lovie Hayes York and Carey Opal Hayes. Lowrance and Marilyn Hodge Engineering Scholarship: Funds provided by Mr. and Mrs. Hodge for a pre-engineering student. Norma Hunt Hayes Nursing Scholarship: Funds provided by Quota International of Magnolia to benefit a nursing student. Kathy Uhrich Hunter Nursing Scholarship: Funds provided by Ray and Daisy Uhrich to benefit a nursing student. Maj. Lawrence E. Jarnagin Lafayette County Scholarship: Funds provided by James Jarnigan in memory of his brother to benefit a student from Lafayette County School. Diane L. and James A. Kimbell, Jr. Scholarship: Funds provided by Dr. Jim Kimbell, alumni, and friends to benefit a student majoring in accounting. Tandy Souter Lowery Scholarship: Funds provided by Sybil Souter to benefit a student from Taylor Arkansas. Magale Foundation Band Scholarship: Funds provided by The Magale Foundation to benefit a student participating in the SAU Band. MHS Class of 1965 Scholarship: Funds provided by MHS Class of 1965 in memory of their deceased classmates. MHS 50+ Reunion Scholarship: Funds provided by MHS Fifties Plus Reunion Group to benefit a student from Magnolia High School. Esther and Linda Samuel Martindale Elementary Education Scholarship: Funds provided by Jim and Linda Martindale in memory of Esther Martindale and in honor of Linda Samuel Martindale to benefit a student majoring in Elementary Education. Ruble Mason Scholarship: Funds provided by Ruble Mason to benefit a student in the Department of Nursing. Georgie Mason Nursing Scholarship: Funds provided by Ruble Mason to benefit a student in the Nursing Program with financial need. Josephine Tate McGill Scholarship: Funds provided by the estate of Josephine Tate McGill to benefit a student with financial need. Dickie Mendenhall Scholarship: Funds provided by W. Chris Elcan to benefit a student. Gail Blanchard Michels Scholarship: Funds provided by Mr. and Mrs. Louis Blanchard in honor of their daughter to benefit a Marketing major. Mary Frances Moore Scholarship: Funds provided by the estate of Mary Frances Moore to benefit a student with an evidence of need. Richard G. and Pam L. Murphy Business Scholarship: Funds provided by Richard and Pam Murphy to benefit a student in the College of Business. Maribeth Wetzig Needels History Scholarship: Funds provided by Lallie Wetzig in memory of her sister to benefit a student a student in the Department of History. Norco SAU Engineering Scholarship: Funds provided by Mrs. Edna Cook Norvell in memory of her husband, Robert A. Norvell, and her brother, Edward J. Cook to benefit a student majoring in Engineering or Engineering Physics. Clark and Maxine Phillips Scholarship: Funds provided by Sherry and Robert Dillender, Total Personnel, Inc. in memory of Sherry’s parents to benefit a student from Glen Rose High School. Joe and Angela Pieratt Scholarship: Funds provided by Joe and Angela Pieratt to benefit an Arkansas resident from a small town or rural background. Lewis T. and Maxine Porterfield Agriculture Scholarship: Funds provided by friends of Lewis and Maxine Pyle Porterfield to benefit a student in the Department of Agriculture. Vernon C. and Nora T. Porter Scholarship: Funds provided by the Vernon Porter Living Trust to benefit students whose families are associated with the Church of Christ. Mary Lucy Martel Ray Nursing Scholarship: Funds provided by Magnolia Regional Medical Center Auxiliary and Auxiliary Board to provide a scholarship for an employee of Magnolia Regional Medical Center to advance their nursing career through a program in the Department of Nursing. James Harold Reeves Music Scholarship: Funds provided by Mrs. Charleane Reeves in memory of James Harold Reeves and his love of music to benefit a student participating in a musical activity such as band or choir. Annie Dean McGuire Rodgers Scholarship: Funds provided by Anne and George Rodgers to benefit a student from Nevada County. J.W. Rowe College of Education Scholarship: Funds provided by Mr. J.W. Rowe to provide a scholarship for a student in the College of Education. J.W. Rowe and Maxine Rowe Duren Scholarship: Funds provided by the J.W. Rowe Family and Maxine Rowe Duren to benefit a business major from Columbia or Hempstead County. BoBo Shinn MAT, Art Education Scholarship: Funds provided by the family and friends of BoBo Shinn to benefit a graduate student in the MAT, Art Education program. Betty F. Smith Scholarship: Funds provided by Dr. Betty Smith to benefit a student from the Marysville/Mt. Holly area. Valerie Stewart Math Education Scholarship: Funds provided by Mrs. Rebecca Stewart Matthews in memory of her sister to benefit a Mathematics Education major. Alice Blanchard Thomas Scholarship: Funds provided by Mr. and Mrs. Louis Blanchard in honor of their daughter to benefit an Accounting major. Charles and Carrie Ann Trexler School of Business Scholarship: Funds provided by Mr. Charles Trexler to benefit a student in the College of Business. Mr. and Mrs. Ray Uhrich Business Scholarship: Funds provided by Mr. and Mrs. Ray Uhrich to benefit a student in the College of Business. Robert E. Upperman Scholarship: Funds provided by Dorothy Camp Upperman to benefit a member of the baseball team who demonstrates financial need. Horace M. and Christine M. Wade Scholarship: Funds provided by the estate of General Horace M. and Christine Murphy Wade. Dr. Benjamin Whitfield Scholarship: Funds provided by family in memory of Dr. Benjamin Whitfield. Bonnie K. Whitmore Elementary Education Scholarship: Funds provided by the estate of Bonnie Whitmore to benefit a student in elementary education. Bonnie K. Whitmore Elementary Education Scholarship: Funds provided by the estate of Bonnie Whitmore to benefit a student in elementary education from Dierks, Arkansas. Bonnie K. Whitmore Elementary Education Scholarship: Funds provided by the estate of Bonnie Whitmore to benefit a student in elementary education from Dierks, Arkansas or Howard County, Arkansas. David Whitmore Golf Scholarship: Funds provided by the estate of Bonnie Whitmore in honor of her son to benefit a member of the Mulerider Golf team. James and David Whitmore Golf Scholarship: Funds provided by the estate of Bonnie Whitmore in memory of her husband and in honor of her son to benefit a member of the Mulerider Golf team. James Whitmore Golf Scholarship: Funds provided by the estate of Bonnie Whitmore in memory of her husband to benefit a member of the Mulerider Golf team. McCatherine Bruce (Mac) Woodward Scholarship: Funds provided by Dr. and Mrs. Larry Embree in memory of Dr. Embree’s esteemed longtime classmate and cherished lifelong friend.